Upgraded FSR XC. Nice and straight wheels, good tires. Hydraulic disc brakes. 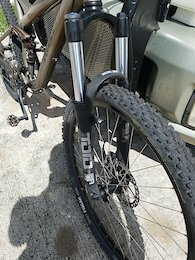 120mm Rockshox Tora + 120mm Xfusion shock. The frame has multiple signs of having been enjoyed but it is structurally sound, no bends, no cracks. Will ship at buyers expense. Bombproof full suspension frame 7000 series aluminum. Linkage is tight without any play whatsoever. 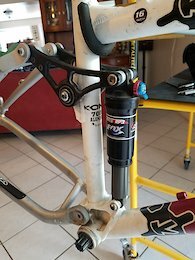 It comes with Fox RP3 shock, bottom bracket and derraileur hanger. Will ship at buyers expense. 2009 DB Sortie in outstanding shape with unbeatable knuckle box rear linkage and 5" travel Rockshox Bar shock. The bike has been used lightly. Rear suspension assembly is tight, no play whatsoever. Headset and seat post collar also included. Other parts available as well. Gently used 2012 Crossmax with rotors. Tires or casete not included although negotiable if needed. Nice set of light wheels, spin true, recently serviced. Ready to go. 9mm QR. Reflective decals. Will ship at buyers expense. CO2 Air Pistol S&W 45 Replica. Lightly used, like new. Very powerful.